Its wonderful to see how the Government of Karnataka, Department of Agriculture is working tirelessly and in many interesting ways to bring the focus back onto grains that once were an intrinsic part of our lives. I am happy to be associated with the movement and do my small bit in promoting the cause of millets. I unfortunately missed the opportunity of attending a breakfast meeting with the Hon’ble Minister of Agriculture in Karnataka, Krishna Byre Gowda at the Taj Vivanta, MG Road recently, I did go in another day to sample the breakfast buffet fare that has now, quite expertly, in the hands of Executive Chef Ramasamy Selvaraju, brought in a range of millets into everyday breakfast dishes. The idea Chef Selvaraju wants to bring out is that we have all, over time forgotten about millets that used to be a part of our everyday lives. By bringing in millets at an upscale restaurant, he wants reintroduce it, in the environment that may be most receptive to it right now. With the right showcase of the various dishes that are possible, he believes that millets can reign supreme again. 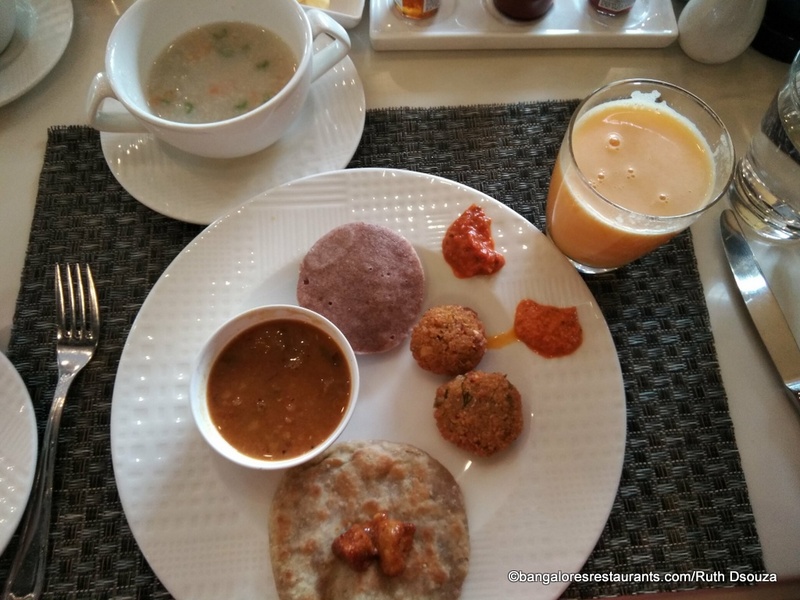 Of course, this breakfast spread has all of the usual inclusions of a full American and English breakfast, but my focus was on the dishes made of millets and that is what you are going to see here in this experience. 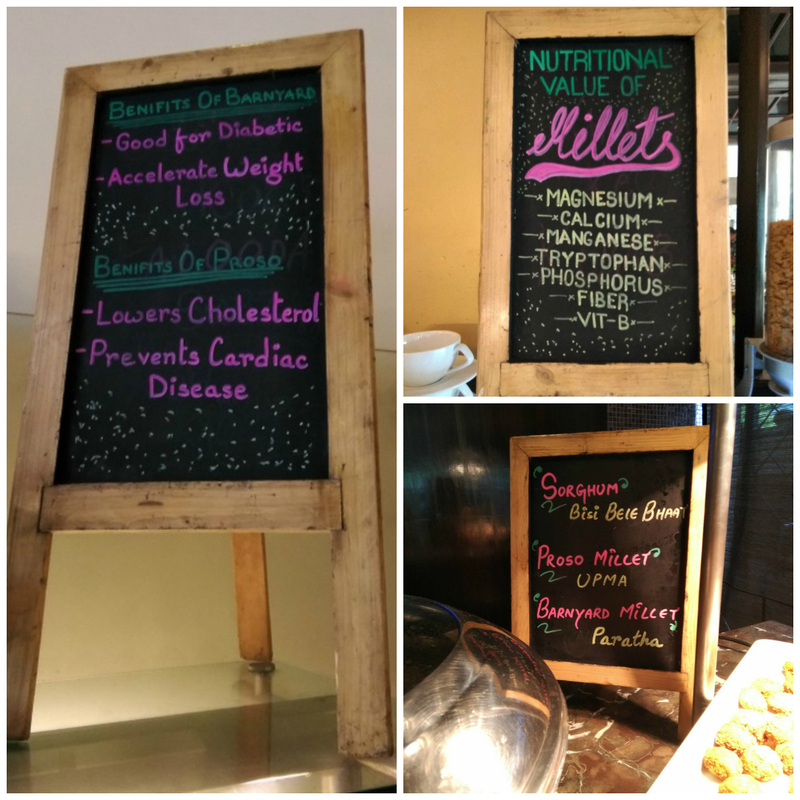 Across the buffet you will see little decorative blackboards telling you the importance of various millet grains that have been used as well as the breakfast dishes that are made of them. At the end of the post, you will also find some great information from the GoK on the nutritional benefits of various millets. 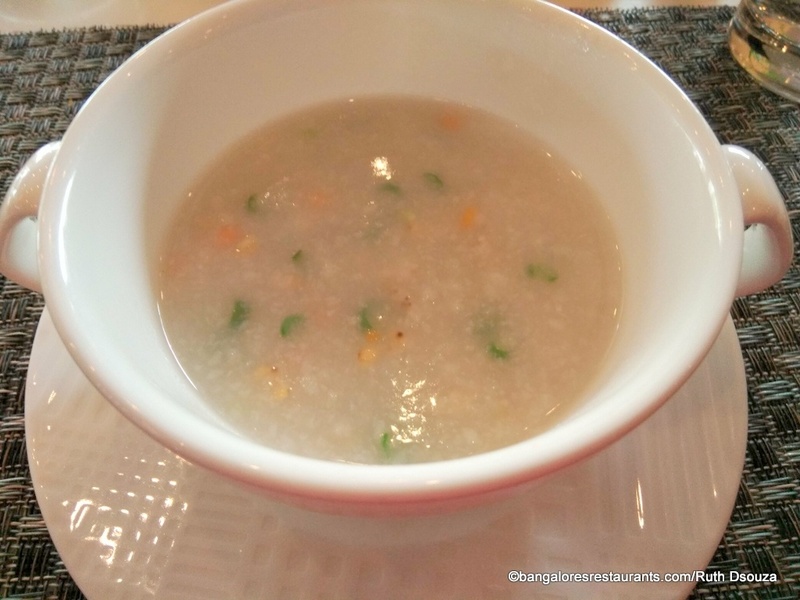 I started off with the classic breakfast dish in Southeast Asia - the Congee made of Sorghum Millet. The classic Congee is bland, this one being a vegetarian version, but it can definitely be souped up a bit with a touch of soy, as is traditionally done. However, from the texture to the wholesomeness of the dish, there is no arguing that the use of sorghum instead of the traditional rice base is a great way to go. Next up I loaded my plate with some interesting, yet familiar dishes - the humble idli, I now had with me in the ragi version. Right beside that is the Masala Vada that has the traditional chana dal replaced with Proso millet and the Stuffed Barnyard Millet Paratha. I also piled on some lovely sambar for my idli as well a garlic and tomato chutney. Each of these three dishes did not fail in the flavour department, underlining the fact that healthy food need not always be perceived as tasting bad. The ragi idli was moist and flavourful with the sambar. The paratha was soft and went perfectly with the mango pickle and the Masala vada got just the right kick from the chutneys. 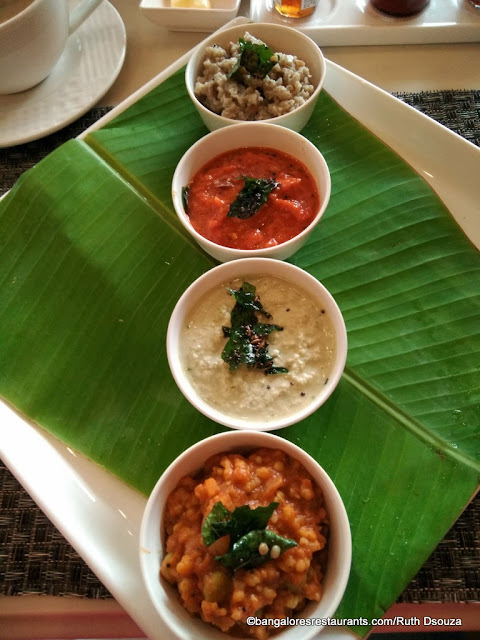 What stood out for me is the fact that despite the millet replacements, the basic taste of the dish remained the same just the way it traditionally does in our homes. 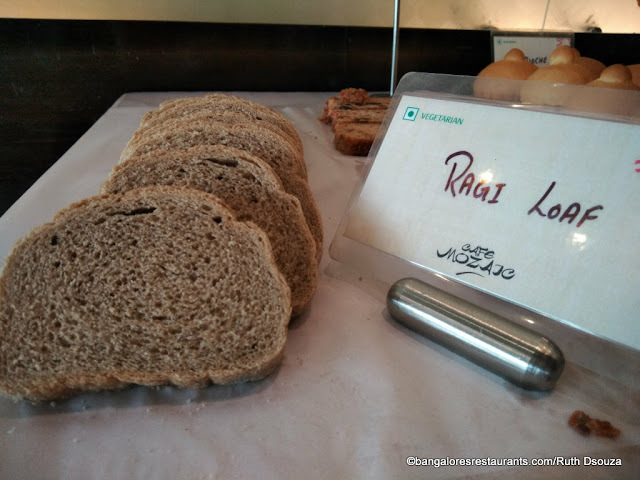 Among the breads and pastries was the Ragi Loaf, which is quite similar in texture and flavour profile of the humble brown bread. 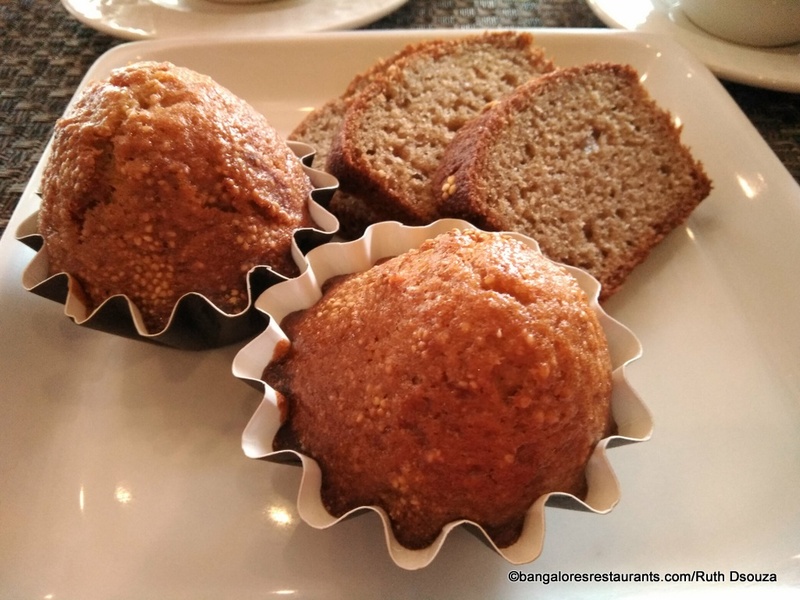 Among the cakes was the Banana Loaf with Proso millet and the Kodo millet muffin. I must admit to hearing the names of these millets for the first time, but am happy I was introduced to them. The millets add a nice crunch and nutty taste to these cakes, making them something you don't mind picking off a buffet table. Banana Loaf with Proso millet and the Kodo millet muffin. 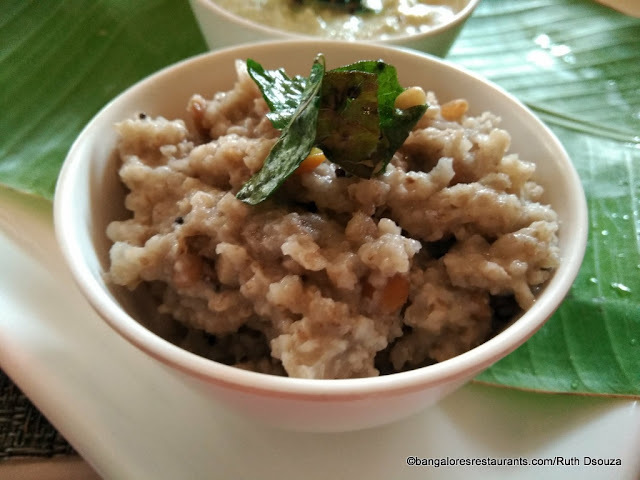 And if you like yourself some traditional South Indian fare for breakfast then you will also find a millet version of them here at the buffet. 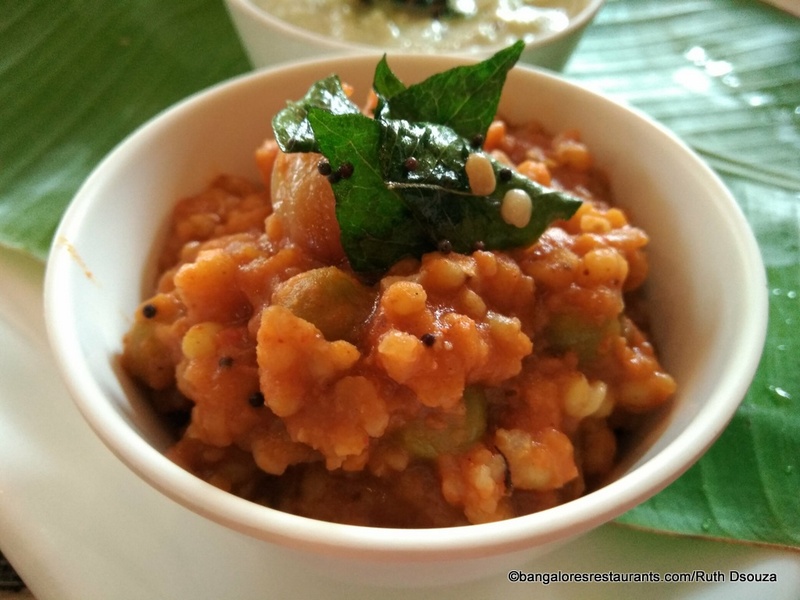 The Sorghum Bisi Bele Bath and the Proso Upma are what Chef Selvaraj has created. I personally loved the upma for its smooth, pasty (in a good way) and overall taste. The Bisi Bele Bath is also a good pick albeit it will take you a short while to get used to the bite of Sorghum millet. This is especially for those of who you love soft textured Bisi Bele Bath. And of course how can we not end such a breakfast spread with a dosa. 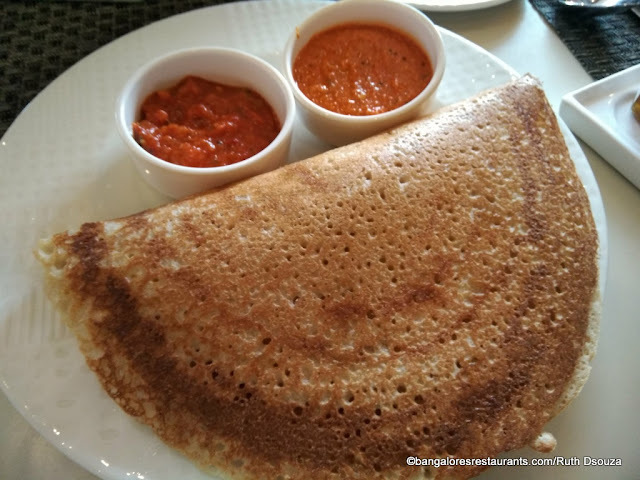 This crispy millet dosa was seriously a treat - we had the plain version simply because we were quite stuffed by this time, but have made a mental note to try out a masala version the next time round. But what are millets? They are ancient grains - (Barnyard Millet, Finger Millet, Foxtail Millet, Kodo Millet, Little Millet, Pearl Millet, Proso Millet, Sorghum) that have made a timely revival and Karnataka is best suited for their emergence and spread! Millets are climate smart crops that can substitute wheat and rice in most recipes, keeping you full for longer. They are also naturally organic, which means they need less or no fertiliser. They are safe, healthy, tastier, versatile and more nutritious! So, children, adults, gen next alike - let’s millet! They grow faster, with minimal fertilisers and pesticides and have a low water footprint. Millets are naturally climate smart. They are typically the last crop standing in times of drought. Some cultivars of pearl millets have been known to withstand up to 64 degree Celsius. Millets have the potential to become a good risk management strategy for the farmers. The multiple untapped uses (fodder, biofuels, food products, brewing and more) can also be of good value for farmers if developed. Millets also have a large scope for further yield development. Millets come with multiple health benefits. They are not only highly nutritional but also provide solutions to some of the highest nutritional problems. These are gluten-free and non acid forming foods. Hence they are soothing and easy to digest. They are considered to be the least allergenic and most digestible of all grains. Compared to rice, especially polished rice, millets release lesser percentage of glucose over a longer period of time. This lowers the risk of diabetes . Millets are particularly high in minerals like iron, magnesium, phosphorous and potassium. Finger millet (Ragi) has the richest calcium content, about 10 times that of rice or wheat. While millets are the Next Gen Smart Food, Karnataka, India’s 1st smart state goes beyond millets, offering a wide variety of organic produce. The proactive government is supporting Organic cultivation in the state through fresh initiatives such as the Organic Farming Policy 2004, Savayava Bhagya Yojana 2013-14 etc. 566 Organic Farmer Groups, 14 Regional Federations of Organic Farmers Associations and R&D centres in various academic institutions have been set up to harness the potential of cultivating, processing and exporting produce that is naturally organic. The state takes an integrated approach to develop natural resources, sustain livelihood and the security of all farmers. Karnataka is where you ‘Go Organic, for your Organs’. The Hon’ble Minister of Agriculture in Karnataka, Krishna Byre Gowda (also Member of Legislative Assembly from Byatarayanapura Constituency) is spearheading the revolution in next generation smart food, with millets and organics. To this end, the Organics and Millets National Trade Fair 2017, 28-30 April, Bengaluru, Karnataka, organized by the Department of Agriculture, Govt. of Karnataka, Karnataka State Agricultural Produce Processing and Export Corporation Limited (KAPPEC), State Agricultural Universities, Jaivik Krishik Society, International Competence Centre for Organic Agriculture (ICCOA) will be the starting point to launch many ideas that are progressive, from a market and consumer standpoint. With exhibition, buyer-seller (B2B) meets, national conference, farmer’s workshops, consumer connect program and organic food court, the fair will create a golden opportunity for Farmers, Organic Retailers, Organic Associations, Dieticians, Students and Academia to showcase India’s potential in Organic Agriculture, Horticulture, Processing and Marketing Sectors. Organics and Millets National Trade Fair 2017 will provide a massive boost to the sustainable future for Karnataka’s farmers.